Opposition parties Congress and CPI(M) complained largescale rigging in first phase of polls held on April 11 and blamed CEO Sriram Taranikanti and DGP Tripura Akhil Kumar Shukla for absence of sufficient CAPF personnel during poll hours. As campaigning concluded for East Tripura constituency at 5 PM on Tuesday, 30 assembly segments in the seat were put under tight security and Section 144 was imposed in all 1,645 polling stations of the seat to prevent law and order situations. Opposition parties Congress and CPI(M) complained largescale rigging in first phase of polls held on April 11 in West Tripura constituency and blamed Chief Electoral Officer (CEO) Sriram Taranikanti and Director General of Tripura Police Akhil Kumar Shukla for absence of sufficient Central Armed Police Force (CAPF) personnel during poll hours. On the issue, Dhalai Superintendent of police Sudipta Das told indianexpess.com that sufficient security deployment was made in Dhalai district to maintain law and order situation on April 18. “There would no dearth of security personnel since additional CPMF personnel were rerouted in East Tripura constituency after first phase of polls at West Tripura seat on April 11. We have central and state armed forces, Tripura Police personnel on duty round the clock. CCTV cameras will be installed in polling stations. There will be sector officers from both civil and police administration apart from flying squads,” the official said. 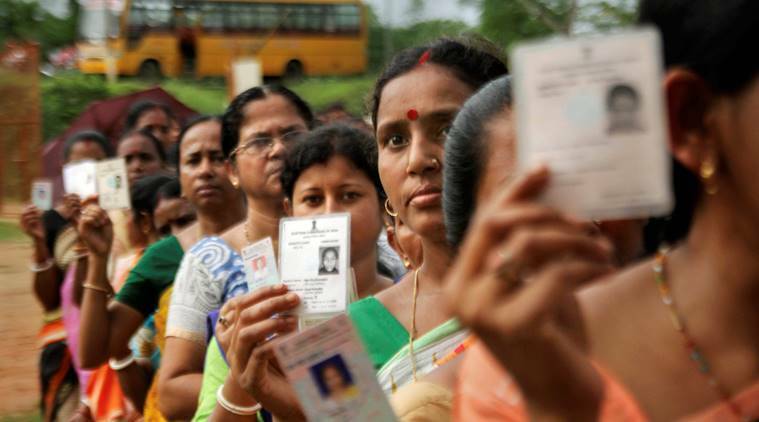 Returning Officer of East Tripura constituency Vikas Singh appealed voters to cast their vote without fear on Thursday and said proper security arrangement would be maintained across the Parliament seat. “After campaign ends on April 16, Section 144 will be in force across the constituency. Poll personnel will reach their destination by April 17. Polling will be held from 7 AM till 5 PM on April 18. All voters should reach out to their designated polling stations and cast their vote,” the RO said. East Tripura constituency is spread across 30 assembly segments and 6 districts. 12,61,861 electors are scheduled to exercise their adult franchise rights in constituency on April 18. They include 6,41,515 male, 6,20,342 female and 4 voters from the third gender. As per reports from the office of Chief Electoral Officer (CEO), 81.74 percent polling was recorded in East Tripura seat in 2014 Parliament elections. The Border Security Force (BSF) has intensified vigil along the Indo-Bangla border. The 856 Km long international border in Tripura, which has got patches of unfenced border areas, would be totally sealed before commencement of polls. While the BJP promised pension scheme for farmers, pledged to extend revision of National Registrar of Citizens (NRC) in other states after the Assam experiment, introduce smart border fencing to stop illegal immigration, pass proposed Citizenship Amendment Bill in the Parliament apart from development of indigenous communities, the Congress party has promised to scrap the CAB, provide direct funding for Tripura ADC, introduce Kokborok, lingua franca of Tripura’s tribal communities in 8th Schedule of the Indian Constitution and the Minimum Income Guarantee Scheme floated by party president Rahul Gandhi. Tripura’s ruling alliance partner Indigenous People’s Front of Tripura (IPFT), who is contesting against their ally BJP this year, has sought votes for their prime agenda of ‘Tipraland’, a proposed separate state for tribals in Tripura. CPI(M) has appealed voters to vote against BJP for their alleged anti-people policies. Speaking to indianexpress.com, CPI (M) candidate for East Tripura (ST reserved) constituency Jitendra Chaudhury said voters are in the mood of defeating BJP and are in favour of communists. However, he expressed apprehension of massive poll violence on April 18 when his seat goes to polls and requested Election Commission officials to ensure extensive patrolling of central paramilitary forces in his constituency. He also sought preventive arrest of identified hoodlums to prevent fear psychosis on the poll day. “BJP’s performance in the centre and state governments has been very unimpressive. People have understood the true meaning of jumla. I believe that voters of Tripura are very adamant to defeat BJP. This franchise will be a lesson for the BJP government that no government can run with anti-people policies,” Chaudhary added. Tripura Congress president and royal scion Pradyot Kishore Debburman said IPFT, BJP and CPI (M) supports have joined Congress in large numbers in last few weeks. “We are confident of victory. People have realized the reality of BJP-IPFT government and have united to support Congress in the Lok Sabha elections. There is a strong vibe in favour of Congress in the state. People have joined us in unprecedented numbers,” Pradyot said. The BJP candidate and first time Lok Sabha contestant Rebati Mohan Tripura said he is confident of victory. “I have got a very good response from people so far. I am confident of victory. People from CPI(M), IPFT, INPT and other parties have joined us in large numbers,” he said.